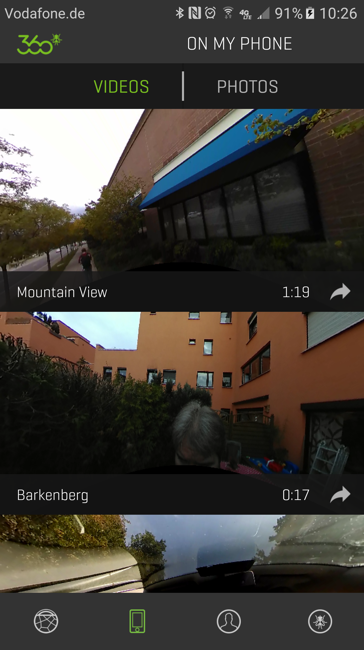 With our latest upgrade to the 360fly mobile app, you can share 360° videos to create Street View collections. You need to record a video with your 360fly camera of the route that you want to digitalize for Street View. The 360fly Mobile application will then process the video and publish it to Street View on Google Maps. If you haven´t used your 360fly camera before please refer to the "Getting started" guide on how to connect your camera with your Mobile application. Or check our How To section. First you will want to record a video of the route that you want to digitalize. Please make sure that GPS is enable on your 360fly camera before recording the video. Here you can check how to enable GPS on the camera. After enabling GPS make sure that the camera has a GPS fix before starting the recording. You can verify the fix by checking the GPS icon in the top right of the live view. If the icon is green you are good to go. If the GPS icon is grey you need to wait until the GPS gets a fix and the icon turns green. To get a fix the camera needs to be outside and it can take a couple of minutes until the GPS gets the fix. Please make sure that the camera is set to a 4K capture mode. You can use the 360° Video Mode or 30 FPS Mode if you want to record with a higher framerate. Refer to Change capture modes on the 360fly 4K on how to do this. Now you can start recording your route. The video cannot be longer than 5 minutes. If you want to record a longer route, please record multiple videos each containing a part of the route. Now you can start recording your route. Before you can share the video to Street View you need to download it from your camera to your mobile phone. Please refer to "Edit a 360fly 4K video inside the 360fly app" on how to do this. After you downloaded and potentially edited your video on your mobile phone you can start the upload. Note: To upload the video to Street View your mobile phone needs to have an internet connection. If you want to upload the video via WiFi please make sure that your mobile phone is connected to the correct WiFi and not to the camera anymore before starting the upload. Start the Street View upload process by tapping on the icon from inside the On My Phone section or choose at the end of the edit flow if you are creating a Clip Capture. Both options will bring up the same system share screen shown in the 2nd image. Next you will want to tap on the Street View icon. If you do not see the Street View icon, it is possible that your video was recorded without a GPS fix. 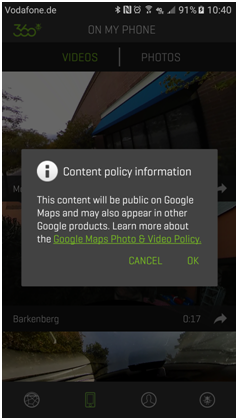 If you share for the first time to Street View you will need to select a Google account, grant permission to share to Street View and accept the Google Maps Photo & Video Policy. Your video will now export with the metadata required to publish to Street View. Last, the video will be uploaded to Street View. Please allow a few minutes for the video to upload depending on your internet connection and the video size. 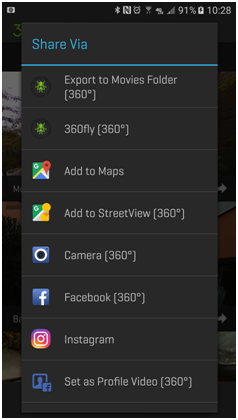 Note: 360° videos posted to Street View could take additional time to show as collections in your Street View app.